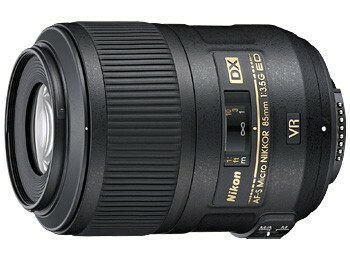 * Compact and lightweight DX-format 85mm Macro lens (35mm equivalent approx: 127.5mm). * 1:1 reproduction ratio offers life-like close-ups. * Closest focusing distance: 0.286 m.
* ED (Extra low Dispersion) glass ensures crisp results. * Vibration Reduction II (VR II) stabilization system: lets you use shutter speeds that are up to 4 stops slower. * SWM (Silent Wave Motor) for fast and accurate autofocus. * IF (Internal Focusing) design for fixed lens length. * Non-rotating front element allows use of lens mounted flash accessories.